Published in The Leopard magazuine. Reading this, I wondered, how many children had played on this old pilot boat of Fittie – recalling fondly that not so many years before I had played on it with my young son Andrew, pretending (of course!) to rescue a shipwreck. Special moments like this come from the extraordinary imagination of the child. Yet I was to discover that history had uncannily served up a real such story in our family’s distant past. This is where the adventure began – at Fittie’s boat. I sent a picture of Andrew in the Pilot boat to his grandfather Stuart who has always had a wonderful recall of family stories. In his reply Stuart recalled how he had been told by his mother about her Aberdeen grandfather the ‘Harbour Master at Fittie.’ That sparked an easily kindled childlike curiosity and the search that followed opened up like a book. It was as if the story beckoned to be told. Captain Alexander Morrison was born on Christmas day 1794 in Foveran. His family had for generations been seafarers with both his father and grandfather having mastered their own boats. So it was that Alexander in his own right became a Master mariner. At Fittie, in January of 1821, Captain Morrison married Isabella Allan a local lass that had captured his heart. Three bairns quickly followed, and whilst family life was simple and basic, it revolved strictly around the Captain and his work. Within a decade Isabella was struggling and what was to follow (as I was to discover) was utterly tragic. This story would have been lost had it not been for an uncanny coincidence that spanned more than a century. Let me explain. At the time I was uncovering the story of Captain Morrison I was working as a doctor at Royal Cornhill Hospital in Aberdeen, so you can imagine how intrigued I was to discover that his wife Isabella had died in my hospital 130 years before! In Isabella’s time the hospital was known as the Aberdeen Lunatic Asylum. As you can imagine, walking the old springy and creaky hospital corridors I could not help but ponder over Isabella’s circumstances and my knowledge of the history of psychiatry painted them vivid and unpleasant. That very next morning I contacted a colleague, Dr Fiona Watson, Archivist for Grampian Health Records – I explained the story and asked, without hope (given how long ago it was) if any hospital records from Isabella’s time might survive? Fiona told me that she thought it unlikely as many records had been destroyed in a flood in the basement of Elmhill many years previous. My disappointment turned to joy when Fiona contacted me later that week to say that Isabella’s records had survived. The Asylum notes in beautiful copperplate made sad reading. 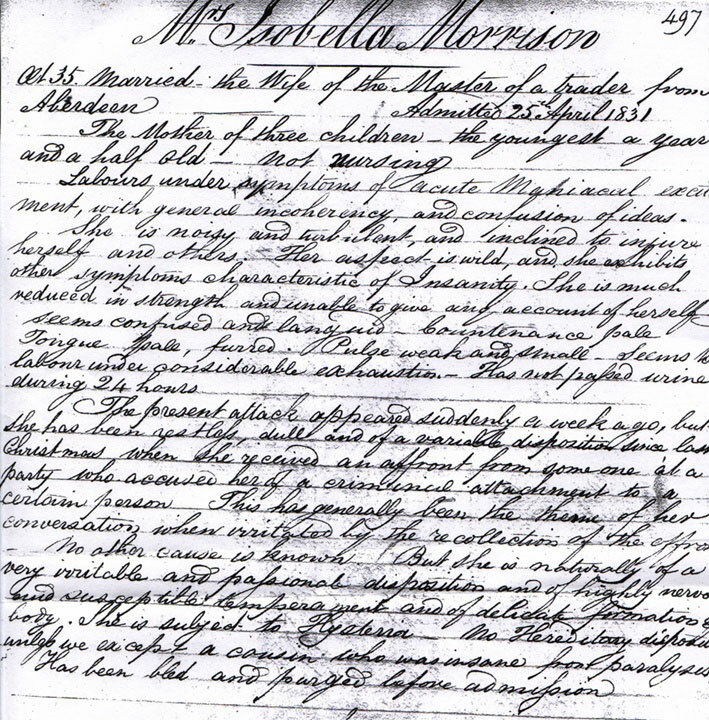 On the 25th April 1831 Isabella Morrison was admitted urgently in a state of florid insanity, she was incoherent and rambling and was described as “noisy and turbulent and inclined to injure herself and others. Her affect is wild . . . she is naturally of a very irritable and passionate disposition. . .” The notes described how Isabella had started to dwell on an innocent remark made at a Christmas party and how she was convinced that she had been accused of an act of infidelity. The doctor found no history of General Paralysis of the Insane (GPI) – a condition of madness brought on by tertiary syphilis. This was the most common cause of mental illness at that time especially amongst seafarers who visited dockyard prostitutes. There was no treatment, care was by restraint and confinement, and she was ‘bled and purged’ in the belief that it would drain away the evil. Not surprisingly she then became weak with heart flutter! Isabella left behind three young children, the youngest less than a year old. She was never to mother them again and spent the rest of her life in the Asylum. When she died forty years later she was severely demented and riddled with tuberculosis. It seems by this time her family had given up visiting her. So it was that as a young man Captain Morrison lost his wife to the Asylum. To help him raise his three young children he brought his mother from Foveran whilst he continued in the frenetic life of the Harbour. Despite such circumstances in May 1836 the Harbour Board rewarded Captain Morrison’s endeavour by appointing him as Captain Pilot of the Harbour. This appointment came with occupancy of the Round House of Pocra Quay and a wage increase to £34 a year. That was not a lot, even back then, and particularly when you realise the Asylum care of his wife was costing Captain Morrison £15 yearly: that was nearly half his wage! Fortunately accommodation on the middle floor of the Round House was rent free, and for the Captain and his family it must have been a rather special place to live. 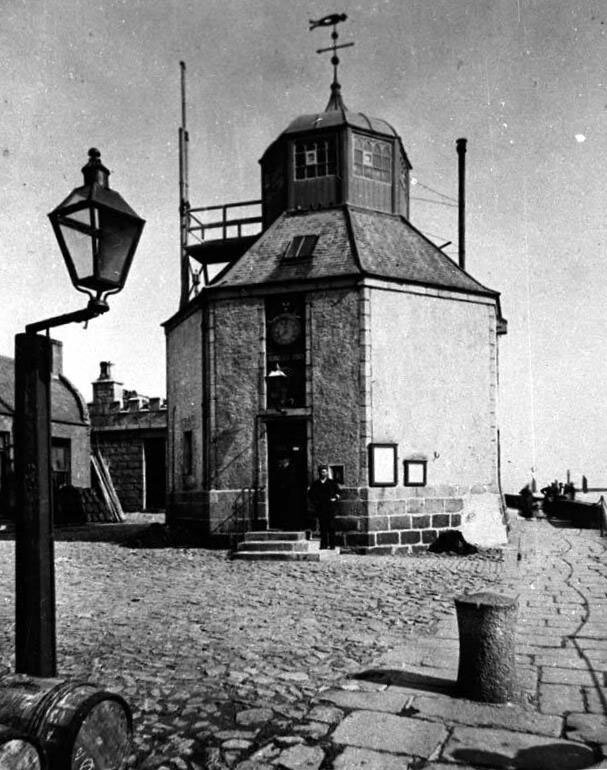 The Round House (it is actually octagonal) has stood at the junction of the Pocra quay and the North Pier, since the late 18th century. It survives as one of Aberdeen’s most historic buildings and has become the symbolic icon of the Harbour. Examination of the Shoremaster’s Accounts for 1797, reveal that the Round House was built at a cost of £225. It was at the Round House in August 1986 that the Queen unveiled a plaque to commemorate Aberdeen harbour’s 850 years as a going concern. Yet the Round House must also be considered as a chatelaine to disaster and has had the indignity of having to stand impotent while three separate ship disasters occurred on its pier. All three shipwrecks took place during the time of Captain Morrison: the Brilliant in 1839, the Velocity in 1848 and the Duke of Sutherland in1853. Fittie had never witnessed such repeated disaster and Aberdeen Harbour gained a fearsome reputation. The wooden paddle ship Brilliant was the first to be lost when she went ashore on the harbour entrance on the 12th of December 1839. At 159 tons gross she was relatively modest in size but had considerable historical interest having been built at Greenock in 1821, with Bell undertaking his pioneering work on the Comet only nine years previously. The Brilliant had sailed from Leith the previous afternoon. 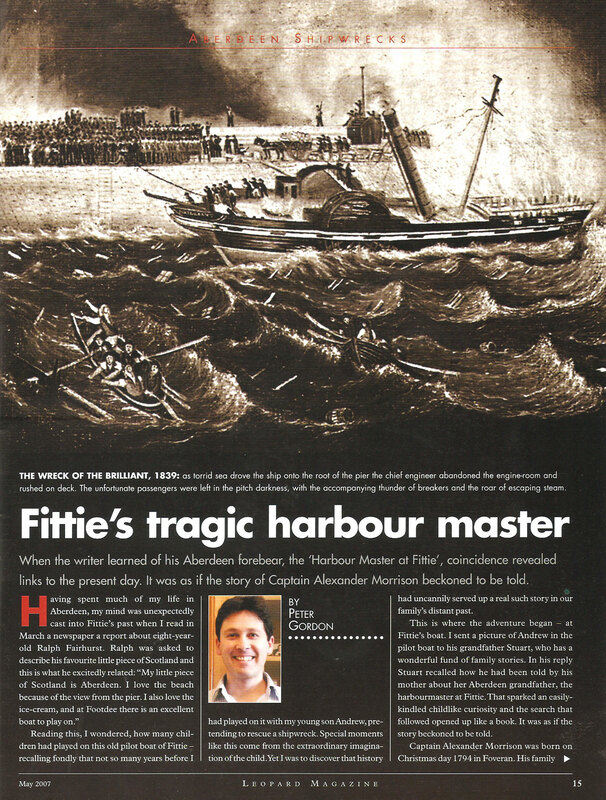 Captain Morrison had been woken during the night with a raging south-easterly gale – this overtook the Brilliant, and early the next morning, off Girdle Ness, her master, Captain Wade, standing on the quarter deck was thrown overboard when the ship rolled violently in a particularly heavy sea. As it was well before dawn there was not the slightest chance of Wade being saved and those on deck had no chance but to run for the harbour entrance. In the beam seas the steamer was carried too far to leeward and struck the North Pier just inside the seaward end. Captain Morrison was unaware of the unfolding drama as a torrid sea drove the Brilliant further onto the root of his pier. It was at this point that the chief engineer abandoned the engine-room and rushed on deck. The unfortunate passengers were left more or less to their own devices in the pitch darkness with the accompanying thunder of breakers and the roar of escaping steam. When the Brilliant finally came to rest she had been driven hard against the pier and those on board were able to scramble ashore without too much difficulty, one of the passengers breaking his leg in the rush to leave the ship. Poor Captain Morrison, it was at this stage he awoke with the cries of the survivors on his very own pier. Surely he must have felt he had failed them. As the paddle steamer had been abandoned in such a rush there had been no time to draw the furnace fires with the result that the boilers, now empty of water, rapidly over-heated, setting alight to the wooden hull. The stern was soon burning fiercely and even though a fire-engine was brought out along the pier it proved impossible to extinguish the flames. Efforts were then concentrated on saving the cargo all of which was transferred ashore before the steamer burned out and broke up. Only two days after the wreck, several lots of the cargo were advertised for sale by a local firm in the same issue of the Aberdeen Journal that carried an account of the Brilliant’s loss! Nearly a decade on from the loss of the Brilliant, another wooden paddle-steamer the Velocity, was lost in almost identical circumstances. The day of deed was the 25th of October 1848. When the Velocity arrived in the bay of the Dee it was low water and she lay off for about an hour and a half until the leading lights were lit at dusk. It is clear that her master, Captain Stewart, did not appreciate the fact that the lights were lit regardless of the tide and steered straight for the harbour. The North pier – home of Captain Morrison – had struck again. It had a horrid vengeance. The Velocity struck with such force that her back was broken and she remained lodged fast on the toe of the pier. Although the lifeboat was called out almost as soon as the steamer struck, a great deal of time was lost in gathering a volunteer crew. Captain Morrison was doing his best– but he had neither the means nor the established organisation to gather pilots quickly from Fittie. 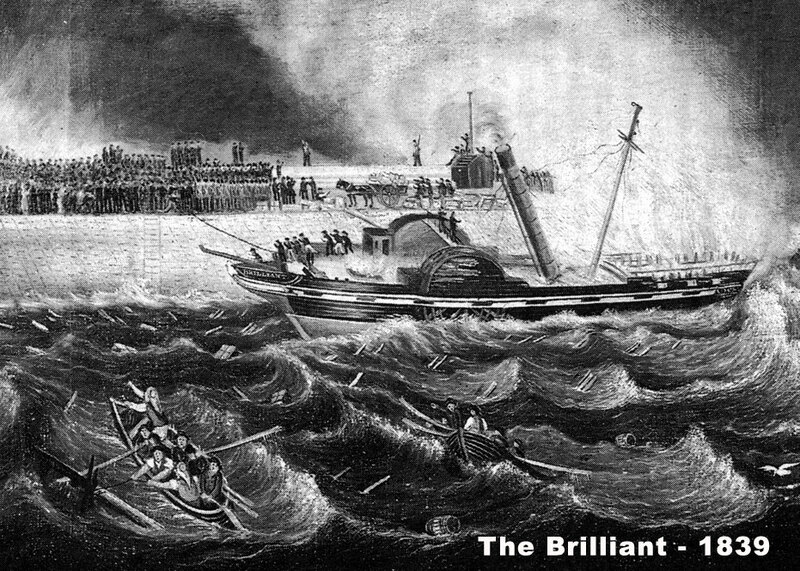 By the time the pilots rescue boat was launched, the steamer’s long boat carrying five of the crew, had managed to get away from the wreck and reach the safety of the harbour. The Velocity broke up with the poop deck carrying the master, mate eight passengers and the remaining five crewmen out into the main channel. They were rescued just in time by the pilots lifeboat which had finally been manned and launched by fishermen who ‘conducted the boat nobly, and took the men off the wreck and brought them to land in the most dextrous and sealike manner.’ Captain Morrison was not aboard and it was subsequently recorded that no one had ‘full authority to take charge’ during the rescue operation and even so the pilots were ‘unwilling’ to volunteer for crew claiming they seldom received anything for their efforts. Captain Morrison must have been rearing sick. The following morning he made his own painful discovery for his mother, who had stood by him all the years, and acted as mother to his own children, was found dead in her bed. Poor Alexander – what a terrible night he had had. Five years then pass with vessels safely passing the Round House. 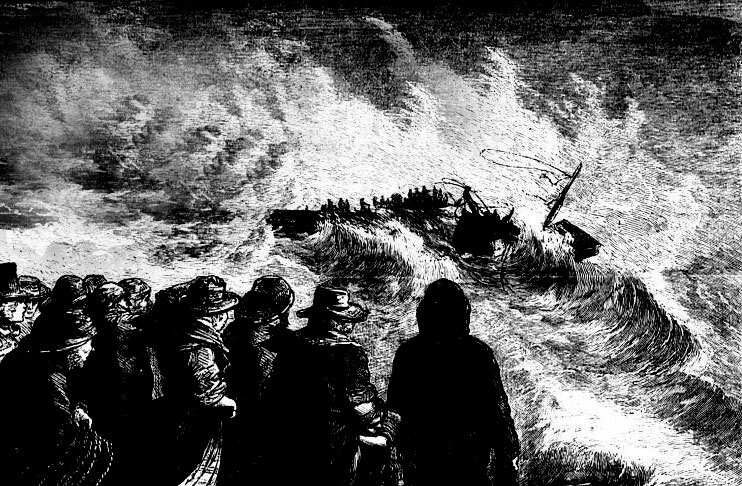 On the night of the 30th March 1853 in a cruel repeat of these tragic events the paddle steamer the Duke of Sutherland was driven completely off course after being struck on the starboard quarter by a very heavy sea. In spite of five or six men struggling with the helm and the engines being put astern she was completely swept by a second sea which drove her onto the seaward end of the North Pier and extinguished the furnace fires. The harbour lifeboat was launched under Captain Morrison’s instruction but having been driven against the wreck and damaged; she had to make for the safety of the beach carrying only fifteen survivors. This still left some thirty people on the rapidly disintegrating wreck sheltering around the starboard paddle-box. Captain Morrison commanded volunteers to help him retrieve lifelines from his Round House; he knew that they could be fired to the stranded vessel using Dennett’s Rockets. However the frantic Captain Morrison must have been cursing as the damp fuses refused to light. It took twenty attempts before even one Rocket fired and several more attempts before a lifeline actually fell across the wreck. After that a pier hawser was successfully drawn aboard but with no proper cradle available one had to be improvised from a box that had floated free from the wreck. At this point Captain Howling, having just been knocked down by a wildly swinging quarter boat entangled in the stern netting, tried to free it but fell off the warp into the sea and drowned in full view of his brother who was on the pier. Simultaneously a salmon coble manned by some seaman and the steamer’s second mate, Peter Ligterwood, who had been brought ashore in the harbour lifeboat managed to put off from the beach and pick up several people who had been washed off the poop of the wrecked steamer. On the way back to the beach the coble fouled some nearby salmon nets and capsized, only one of the crew of six men reaching the shore alive. It was then that the hero of the disaster emerged. 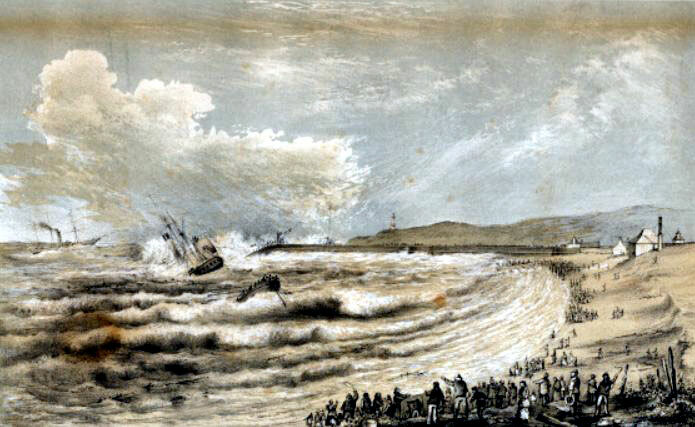 The Chief Steward, Duncan Christie, took charge of directing rescue operations on the stranded paddle-steamer and with a mixture of ‘extraordinary effort, encouragement and the occasional threat’ succeeded in safely sending ashore the twenty or so people who were still aboard the midship. Finally, having ensured that all of the survivors had reached the pier safely Christie left the wreck with a knife clenched between his teeth in case the rope pulling him ashore became entangled. In fact this is exactly what did happen and he had to cut himself free just as he reached the pier. Because of the heavy loss of life Aberdeen Harbour Commissioners immediately appointed a full-time paid crew for the lifeboat and ordered an enquiry. It emerged that the lifeboat had arrived alongside the casualty only half an hour after she had struck but had been so badly damaged by floating debris during the rescue that she was unable to return to the stranded steamer. Severe problems were caused by nearby salmon stake-nets which entangled some of those swept off the steamer. The delay in the use of the Dennett Rockets was found to be due to a combination of inexperience, heavy spray soaking the rocket fuses and misguided interference from the huge crowd of onlookers. Captain Morrison was in his sixtieth year when the morning dawned on the wreck of the Duke of Sutherland. He was never to recover and developed, in the year that followed that frightful night, a chronic chest condition, which stemmed from the drenching he had received. Three months after the Duke of Sutherland was shipwrecked, Captain Morrison was served with newly issued regulations made after an emergency meeting of the Harbour Board. The twenty-one separate regulations leave no doubt that this was a reprimand, but more than that, a confirmation that safety of the harbour was the over-riding duty of the Captain Pilot. Reading the list I was left to feel sorrowfully sick for my distant grandfather: simply he had failed as Fittie’s gatekeeper. Alexander Morrison is my great, great, great, great grandfather. I would love a copy of the short film made on him. Hi Peter. Amazing story with great detail. I notice and earlier site of yours stating that Captain Alexander was the son of William Morrison of Foveran. I’m working on the family of Alexander Morrison who married Jane Murdoch in 1796 in Foveran. They had 8 children two of which we know went to Prince Edward Island, Canada in about 1834. It is suggested that Alex (supposedly a captain, as well) and Jane also made the voyage but Alex died at sea. Do you think there is any connection? I believe that my great, great grandfather became harbour master shortly after Captain Morrison. His name was James Duncan and he lived in Castle St. He is described in the 1891 census as a retired harbour master as well. if you had any information on him, I would love to hear it. Please can you tell me where the date of Captain Morrison’s appointment as Harbour Master was found? My records show him to be Harbour Master until 1857, but do not have a start date. Many thanks Ray for your kind comment and for getting in touch. My memory gets more fuzzy with time and I did this research more than a decade ago! However I am pretty certain I got the details from Aberdeen City Archives. I recall climbing stairs and transcribing from their Registers. So many ‘facts’ can indeed be hearsay or whispers misheard and misrecalled. However I am reasonably confident that i have Captain Morrison’s start date correct. If you can add to the story then i would be thrilled. 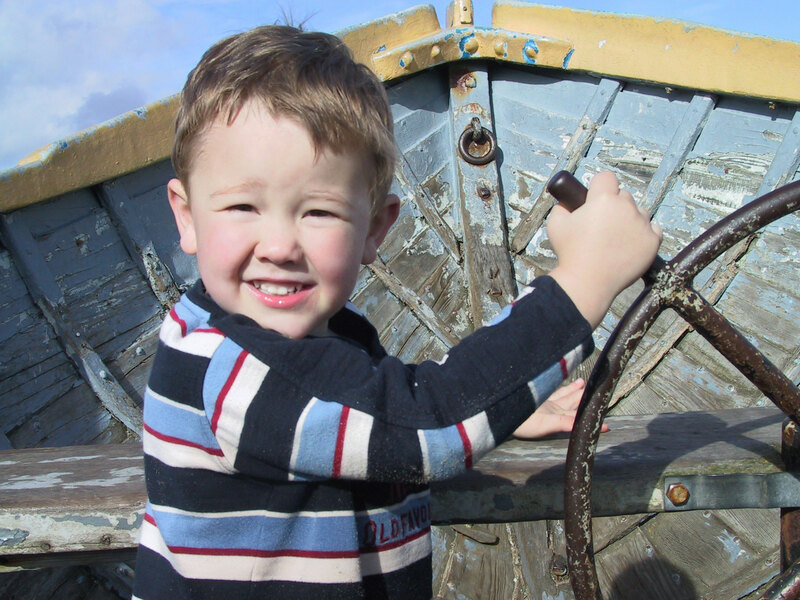 Hi Peter – just a minor point – the boat the wee boy is playing in wasnt a old pilot boat it was an old salmon fishing boat. We lived in North Pier Villa just opposite the round house iuntil around 1964 – my father was a pilot. The last house onleft was where the head salmon fisher lived (Hughie Gavin). The Salmon fishing boats used to lie opposite our house in front of the round house and as kids we used to play amongst the fishing nets that hung there. Great Story about your grandfather.